Disana's Wool Sleeping bag is a special sleeping bag for newborns that offers safety and closeness. Absolutely free of toxins, Disana Sleeping Bags are made from a wonderfully soft, organic, merino wool and are handmade in small facilities in Germany. The light-weight, breathable sleeping bag offers a cosy layer of warmth without overheating your baby. 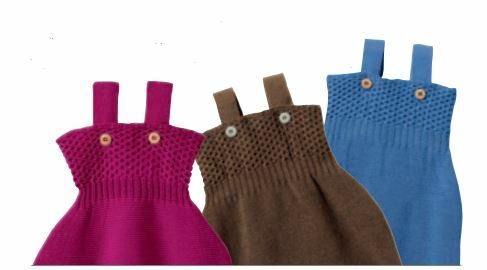 The high, stretchy knitted waistband gently hugs your baby while the wide straps keep the sleep sack in place. Disana Sleeping Bags are great in warm and cold weather and are now available in Canada in a range of beautiful colours. You can even let your baby sleep in the Disana wool sleeping bag without a diaper cover! Simply lanolize the sleep sack to make it waterproof and dirt repellent. Available Colours: green, natural, hazelnut, red, medium blue, teal blue, plum, berry and rose. Second purchase for the big one, bought the smaller one prior and loved it. It is not too heavy but also not too light. It breathes well and does not need to be washed much, just spot clean if there is spit up. It also looks just gorgeous on baby! I would have given this sleep sac 5 stars if it wasn't for the fact that the threading on the armpit area of the sac is coming apart after only a couple of days of use ... and I am not handy with a needle and thread. Expected a more sturdy construction for the price paid. Otherwise keeps my 13 month old cozy at night with room to grow. I absolutely love this sleeping bag! It's so BEAUTIFUL especially the yoke of the bag. I went ahead and ordered the largest size in the interest of saving money and it fits my 3 month old well enough. I am in the process of lanolising them so I can't comment on their u use as the outer layer of night time diapering but I plan to try it out! Love the sleep sack, and it looks very sweet on baby. The shoulder straps seems thin but not sure it needs to be thicker anyways. I would have liked a third set of buttons to adjust the straps but I ordered the size 2 for my 10 month old and it fits very well with room to grow. She is cozy. I do use layers as it is cool in our room, although I don't think that it would be necessary as merino is warm. Very nice to have an organic wool product at a reasonable price. I liked it though I thought it would be softer. I really hope it wont't be itchy for baby's skin. I was thinking about getting this sleeping bag for a while and couldn't decide,if I wanted it or not. Finally I got it and am very happy with it. I should get it in the beginning,lol... It's nice, generous in size as all Disana products. I got size 1 and it fits still very well my almost 11 month old.Actually he still has some room to grow. I use it for night time- put it over just a woolen body and diaper - it's great solution for over night wool cloth diapering.I still use over it a duvet,but we keep our house cool. I would recommend it as a great shower gift for a new baby. It's something a new mum usually don't think. This sleeping bag can be used in the beginning all around the clock keeping the baby nice warm and comfy. Very happy with the purchase. I'm loving this sleeping bag. My 14-month-old is big for his age but the Size 2 fits great. He can move around easily and seems happy wearing it. The wool is very stretchy so even when he grows to reach the end of the bag, I can't see it restricting him at all. Because of the stretchiness I've started crossing the straps over at the back, to stop them slipping off his shoulders. Once he's taller I'll uncross them. There are also two button settings, which allows for extra growing room. I was a bit disappointed to notice a hole developing in the wool next to one of the buttonholes after a few days' use, but that was easily fixed with a needle and thread. The bag is light, cozy but breathable, warm but not thick or bulky. I love that wool regulates temperature, and it feels like a better choice for chilly nights or variable apartment temperatures than cotton or polyester. Very happy with it.